Has anyone seen the American TV series, ‘Overhaulin’? You can still catch the repeats in some of the distant regions of the Sky programme guide, but for those who aren’t familiar, a team of experts from the world of engineering and paint and interiors, headed by car designer Chip Foose, turn an old rust bucket into a pristine automotive masterpiece. They have seven days to strip and rebuild their victims; all owned by unsuspecting members of the public who think that they’re pride and joy has been stolen. In fact family members have set them up to have their car ‘overhauled’ by the team and a week later what was an old scrapper is then presented to an over-emotional American car owner, all shiny and new. I have to say that every project is done really tastefully and not like the over-the-top mess of “Pimp My Ride”. So this gave me an idea, without actually stealing a family members’ car, could I do something similar in just seven days? OK, so I don’t have the million Dollar budget, but, up for the challenge (or I’m stupid as a friend called me the other day when I said I was doing this). I’ve set a budget of £2,000 and intend to make a decent return of at least £500. As we know used car prices are crazy at the moment so what can I buy that isn’t going to cost the earth? The challenge would start at soon as I was standing in a driveway ready to do a deal. 24 hours later I turned up on the seller’s driveway, with the money in my pocket, to have a closer look. The countdown to D-day in just seven days time had started. I was pretty sure that this wasn’t going to be plain sailing but had committed to a two and a half hour drive none the less. Still, the Capri’s 26 year life span had aged it reasonably well and it was in a better condition than I thought. There were a lot of large rust spots including the typical rotten wheel arches and door shut scars. The bonnet and both front doors needed a re-spray as the paint had peeled straight off. The inside however hadn’t worn as well. The Recaro seats were torn quite badly with the thigh and side bolster padding’s sunken badly. The headlining was sagging too and the carpets were showing signs of rust stains. It was also a tad musty but I knew a good upholsterer who could completely overhaul the interior, but at a cost that could jeopardise the whole project. This wasn’t looking good. My initial repair budget was stretching and all I could see was more and more £ signs. Waiting for the owner to get the keys for a test drive, I popped open the bonnet to have a peek over the wires and metal. I have to say that the engine bay looked immaculate, too immaculate in fact and I started to wonder if it’d had any major mechanical work done. Still on the drive it seemed to pay off as the old Capri felt good to drive. I couldn’t detect any signs of steering wear, gearbox or clutch problems and the ageless V6 pulled without any hesitation or stress. It handled well too, without giving off any signs of ageing creeks or knocks. Having brought along my jack and workshop tools I had a closer peek over the Capri after 15 miles behind the wheel. It all seemed reasonable for its age and I couldn’t detect any visible issues. The seller revealed that the last owner had spent over £200 (with the bills to prove it) under the bonnet on general mechanical and electrical items and had it cleaned looking for an old oil leak. This answered my doubts over why it looked so clean. With the leak repaired the bonnet had rarely been lifted since, so everything was kept nice and tidy. £995 started to become less heavy on the wallet and with seven days to go I had a decision to make. Hoping my purchase wasn’t going to go sour we started negotiating on price and shook with £750. The Capri was mine. Day 2: slightly excited at re-kindling an old flame, I took the train to collect the Capri having booked it into the bodyshop later on that afternoon. It didn’t miss a beat travelling down the M1 and having dropped it off I went home waiting for the good news! Apparently the rust was worse than my untrained eye had picked up and had eaten right through both rear panels. They were too far gone to be repaired but at least the bonnet and doors could be re-sprayed with a few extra touch-ups here and there. Two rear panels, as I discovered, were hard to come by but with a bit of scouring on the internet I found an old Capri that was available for parts. They came in at £30 each and weren’t in the best of condition but were good enough for what we needed. With panels and bumpers removed the bodyshop stage moved into day 3 before the Capri was prepped for surgery. Day 4: with a £330 bill just paid for the paint and panels, the Capri was collected and moved over to my local mechanic who would have a proper look over the car. This was probably the most worrying part as I had visions of my money being completely flushed down the loo. With just under four days until D-day (and still not ready for the ad) I was given another list of things to be done on the Capri: water pump £40, alternator £54, battery £60, belts £36, spark plugs £11, oil filter £6, oil £18, pads and discs all round £110, brake fluid £4 and two new tyres £87 plus the labour at £150 Luckily my mechanic worked late into the day and had everything wrapped up in time. With the Capri having had all its birthdays in the last 48 hours, the next job was to get the upholsterers in to fix up the interior. Fortunately, they provided a mobile service so at least it could save me some valuable time especially as I was now up against the clock. Time was starting to run out with only three days left to get things finished. It was too late for the usual ad on the internet so a call to the local papers should but me in good stead for a possible sale. The total cost of the ads came in at £63. Having seen the interior, my trimmers were slightly perplexed with the amount of work to be done. My (hugely under estimated) description over the phone had got them scratching their heads. Ooops! It would be very tight, but with two days work ahead to get it back to some sort of presentable condition they pressed on none the less. Their converted truck had everything inside, from high-tech sewing machines to a small trim-room with racks of fabric and leather where almost every colour combination was available. It was great to see traditional methods still being used as a dull, old interior was slowly transformed. Surprisingly it didn’t look like it had been re-trimmed at all as the new fabric and re-foamed seats blended in and looked like it had been lived in for a while. I didn’t want the Capri to have the appearance of a semi-restored car, mostly because I would have had to spend a lot more getting it back to an original condition. Even so, I was over the moon and started thinking I might keep the Capri myself (The perennial problem with these little ventures). 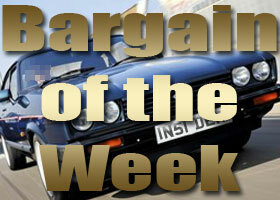 I advertised the Capri for £2,500 after having received some sound advice from the Capri owners club. My only regret is not having any images in the advert but I’d hoped that the thorough description would at least get the phone ringing. Talk about getting it finished by D-day. The day the adverts appeared in the papers the trimmers still had another’s’ day work ahead as a fabric set back had delayed their work and a £445 bill to follow. So on day 7, whilst working around a busy Capri, I squeezed in another four hours work cleaning it from top to bottom. By 7pm day 7 it was finished. I had done it. Well, sort of. I still had to sell it to fulfil the final part of the challenge. By 9pm on day seven the phone hadn’t rung and I had an unsold Capri, albeit a nice example, sitting in the drive way. Halfway through the Xtra Factor on ITV2 the mobile rang. I had a potential buyer. He seemed keen and wanted to come round and have a look. More importantly he wanted a Capri and couldn’t stretch his budget to some of the finer examples for sale – some going for as much as £8,000. Day 8: As I’m writing this on my laptop the Capri has just been sold. The one and only phone call turned into a £2,450 sale. With £2,193 spent, £193 over my budget, I’ve earned a £257 profit. Not what I’d hoped for and yet again another tiny profit margin. OK, so it’s more of a hobby for me than a business venture but it does give me the taste and shows just how difficult it can be in the motor trade, I’m no Chip Foose and my Capri was far from the grade expected from “Overhaulin” but it was great fun along the way. So what’s next? Another seven day challenge?